It’s not your normal type of dread, like the kind that takes up residence in your stomach every time you pay bills or when your boss unexpectedly arrives at your weekend place with Vuitton bags in hand. No, this dread is more primal. It occurs every November when I know I’ll once again be facing a fixture of the Thanksgiving table: pumpkin pie. Now, I’m all for tradition. But come on, people! It’s been 382 years since the Pilgrims sat down and made history. Shouldn’t we have a little more to show for it in the dessert department? Refusing to be a gastronomic automaton and mindlessly bake yet another pumpkin pie, I instead went searching for a new American classic. First I turned to Craig Underwood, owner of the Underwood Family Farm in Moorpark, CA. Each year he sells his pumpkins at the annual Fall Harvest Festival. With more than 70,000 people foraging for the perfect orange gourd, I figured he’d have some ideas. Of course, that’s like asking a father which of his children is his favorite. So he added pumpkin cookies and cheesecake to the list. That got me thinking that cake—minus the cheese—could possibly be this year’s pumpkin pie. Yet something was missing. That night I was crunched down in bed nursing a wicked flu and flipping through the pages of The Vineyard Kitchen by Maria Helm Sinskey (HarperCollins, 2003). 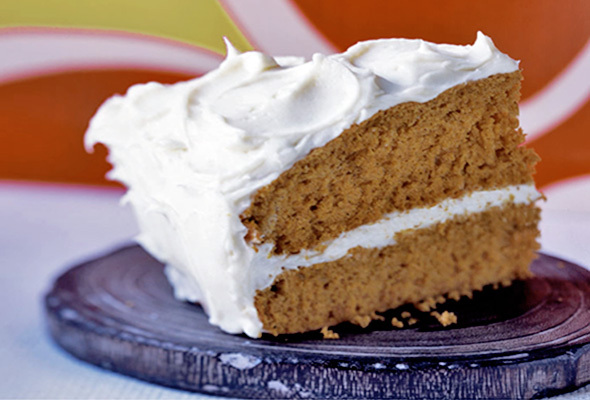 My eye landed on a recipe for a cake slathered with maple-flavored cream cheese frosting — the missing link. With that, I tumbled into the most restful sleep, perhaps owing as much to NyQuil as to the dessert I was certain would change the face of the American Thanksgiving menu. The next morning as I was rummaging through the cupboard gathering ingredients, I remembered the words of Sara Jane Underwood, Craig’s wife: “There’s a dirty little secret in the pumpkin world,” she warned. “The canned stuff tasted nothing like the real thing.” If I wanted true pumpkin flavor, it was into the pumpkin patch for me. According to Sara Jane, sugar babies, which are about eight inches in diameter, are the pumpkin of choice because they have thick flesh and little moisture. To use them in the below recipe, quarter one pumpkin, and remove the stems and seeds. Place the pieces skin-side up on a foil-lined baking dish. Bake for 45 to 60 minutes at 350 degrees. Let cool, scoop the flesh into a food processor, and whir. So with apologies to Mayflower descendants everywhere—America, may I humbly introduce your new Thanksgiving dessert. Photo © 2003 Pornchai Mittongtare. All rights reserved. All recipes and photos used with permission of the publisher. That looks lovely, I would previously been content with pumpkin pie but I’m going to have to give it a go.